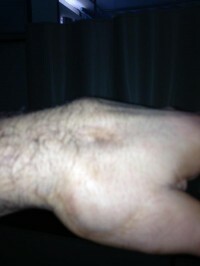 Vitor Belfort posted this photo of his broken hand on Twitter. TUF Brazil coach Vitor Belfort will no longer be able to face opposing coach Wanderlei Silva in the UFC 147 main event on June 23 in Belo Horizonte, Brazil. Belfort broke his hand during training and underwent surgery on Saturday. UFC President Dana White confirmed the news to ProMMAnow.com (www.prommanow.com) and a group of reporters following Saturday night’s UFC 146 card in Las Vegas. Silva will still fight on the card in the main event, however, a new opponent has not yet been determined. “Still can not believe what happened, more so in life is to overcome our obstacles we count on you guys. The UFC 147 card was originally scheduled to take place at a soccer stadium in Rio de Janeiro and feature Anderson Silva vs. Chael Sonnen in the main event. Due to a scheduling conflict with the United Nations taking place during the same time period, the Silva vs. Sonnen bout was moved to UFC 148 in Las Vegas and UFC 147 was moved to the smaller Jornalista Felipe Drumond Stadium in Belo Horizonte.